Hero Histories: Return of the ORIGINAL FanBoy PLUS: Discount coupon! Return of the ORIGINAL FanBoy PLUS: Discount coupon! The Boy with the Most Comic Books in America! Nope, it ain't YOU, Bunkie! 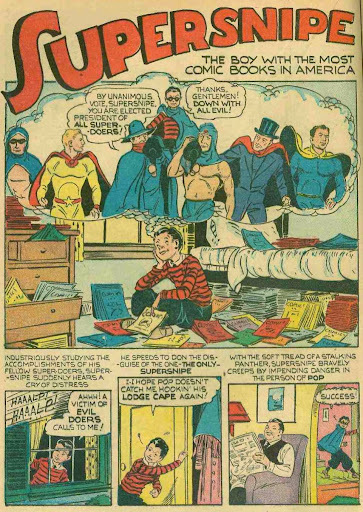 In one of the first comics metafictions, Koppy was a kid who read comics and then daydreamed about being a superhero himself, including interacting with other comics characters, who were fictional characters in his world, as well as real-life villains like Adolf Hitler! 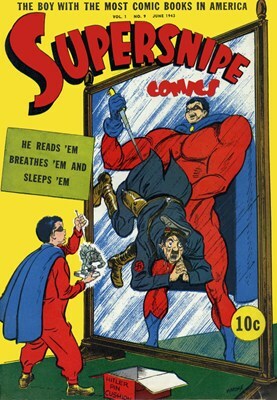 Debuting in the back pages of Shadow Comics, he quickly transferred to Army & Navy Comics, becoming so popular that the book was retitled SuperSnipe Comics as of #6! Not content to merely fantasize about heroics, McFad donned a red flannel union suit and attempted to crush evil in his neighborhood, usually with embarrassing (but humorous) results. Ironically, he outlasted most of the superheroes who inspired him, ending his title's run in late 1949. Curiously, his adventures haven't been reprinted, resulting in his comics being among the most expensive on eBay and other venues! So we've brought him back on a new line of collectibles including t-shirts, mugs, iPhone cases, and a 12-month calendar! Some, like Captain Klutz, have worn red woolly underwear, but most, like Flaming Carrot and FanBoy, don't. But all owe a debt to the first FanBoy...Koppy McFad! What could be a better Christmas present for the fanboy (or fangirl) in your life than a kool SuperSnipe kollectible combined with one of the related books listed below for a fan-dream gift set? *Save $5 off orders of $40 or more, excluding shipping charges, gift wrap charges, applicable taxes and custom duties. Coupon code SEASON40 must be entered at check out. Promotion starts on December 9, 2010, at 12:01 a.m. (PST) and ends on December 12, 2010, at 11:59 p.m. (PST). Cannot be combined with any other coupons or promotions and may change, be modified or cancelled at anytime without notice.